If you suspect vehicles are being driven without valid documents or have been abandoned. If a vehicle is untaxed and parked on a public road or pavement then the DVLA may want the Police to seize it on their behalf. Before you decide to call the Police you can check the status of ANY vehicle tax and MOT yourself to see if there is a problem. 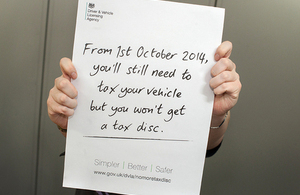 Updates and advice on abolition of the vehicle tax disc. You can tax the vehicle using the New Keeper Supplement (V5C/2) part of the vehicle registration certificate (V5C) online or by phone – 24 hours a day, 7 days a week.